Antique silver, Oriental and European porcelain, taxidermy, a 19th century pony and trap and a 1963 Morris Minor, garden furniture, old military uniforms, art including a private Irish collection of engravings and drawings by a range of artists including Durer, Van Dyck and Tiepolo and Lady Kildare’s writing desk from Carton are all included on day one of Fonsie Mealy’s two day summer auction in Castlecomer on July 10 and 11. The sale on day two features a pair of oak armchairs to a design by Pugin, a stained glass window depicting St. Patrick, 18th century portraits, an Edwardian dolls house in the Tudor style and a Victorian rocking horse, and an interesting selection of art and antique furniture. A total of 900 lots will come under the hammer, 500 on Tuesday. 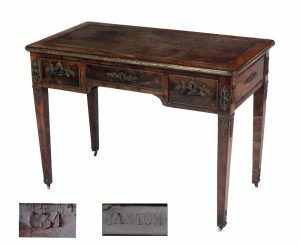 The sale comprises lots from a number of houses including Morristown Lattin, Naas, Albert House, Co. Sligo, and Irish American collection and Spire Hall, Portarlington, home of the Odlum family. 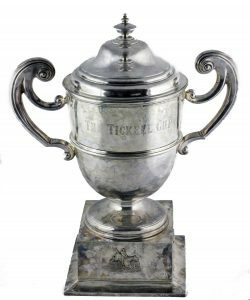 The Tickell Cup, a massive two handled trophy cup made in London in 1899 on an Irish silver stand with three engraved races from Dublin in the same year is estimated at 4,000-6,000. 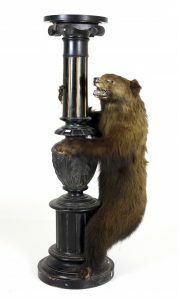 Lot 281 is a staged specimen of a brown bear cub holding a carved pillar, lot 430 is a cast iron model of a Phoenix from the Royal Phoenix Iron Works, Parkgate St., Dublin (1,500-2,000) and lots 676, the dolls house is estimated at 150-250. There is an Irish Penal chalice and a George III freedom box. A three stone diamond ring with an intense yellow centre stone (20,000-30,000) and three Victorian diamond studded star brooch pendants (5,000-7,000) will are jewellery feature lots and Irish furniture is well represented. There is a 19th century High Sheriff of Ireland uniform from the Mansfield family of Morristown Lattin (400-600) and uniform jackets including the Kildare Militia. A Kingsbury Motor Blue Bird toy model car is estimated at 180-220. Sir Malcolm Campbell broke the land and water speed record using blue birds in the 1920’s and ’30’s. His son Donald also broke land and water speed records and died in 1967 during a speed attempt on Coniston Water. The catalogue is online. 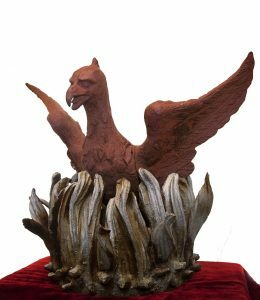 This entry was posted on Sunday, July 8th, 2018 at 7:31 am	and is filed under ART, AUCTIONS, COLLECTIBLES, FURNITURE. You can follow any responses to this entry through the RSS 2.0 feed. You can leave a response, or trackback from your own site.